When we released our real-time messenger, we tried to push aside the traditional live-chat model, and instead took our cues from modern messaging apps. Our sermon was that businesses talking to customers should feel as natural and familiar as friends talking to each other. But we quickly learned we didn’t go far enough. We realized our Messenger fundamentally lacked a heartbeat. When a customer wasn’t involved in a live conversation, messages could feel like they were being sent into the ether. What happens when I send my message? Will I receive a reply right away? When messaging friends and family, we’re used to conversations that are both real-time and spread out over several hours or days. But when it comes to customer and business communication? Not so much. We’ve worked on several indicators to help control expectations around our Messenger, and would like to share some of the product principles that informed one of these features – the read receipt. Read receipts, signals that tell you a message has been seen, are now a core feature of messaging apps. But the implementation differs across platforms; some with more success than others. What’s interesting about Apple’s approach is read receipts are turned off by default. People have to make an effort to turn them on. As most people don’t bother doing this, the real value of the read receipt is lost in most conversations. Facebook flipped that model on its head. And not just because they use their nifty falling faces to indicate a message has been read. They don’t just turn read receipts on by default; you can’t even turn them off. It was controversial at the time. Read receipts are seen by many as the hall monitor of the messaging world, holding you accountable for any lapses of communication. But Facebook understood that messaging works better if it’s more transparent. If read receipts are so controversial for personal messaging, why bother building them for businesses? Particularly since standard practice for businesses is to reveal as little as possible of what’s happening behind the curtain. At Intercom, we deliberately optimize for the end user, not just the business. We believe our customers are best served when their users and customers have a great experience. And part of what makes a great experience is transparency. The read receipt, even when nobody replies, is a token of communication. It takes people out of the state of unknown, and subtly indicates the immediacy (or not) of the conversation. As long as the “Not seen yet” label is present, the user knows they’re not going to get an immediate reply. Read receipts are also about changing behavior. Businesses need to get much better at using quick, short, conversational messages. Even if it’s something simple like, “Let me check on some things and I’ll get back to you.” Read receipts encourage businesses to give these quick acknowledgements. It’s about changing business mindsets about how to talk to customers. The world of lengthy, formal and delayed communication is quickly being left to lawyers and bureaucrats. When it came time to design, there were three product principles we adopted to ensure that everyone got the value of the feature, and that provided the transparent and conversational messaging model we wanted. Just like in the Prisoner’s Dilemma, if given a choice, businesses and customers are likely to opt out of read receipts, choosing individual reward over collective good. And when nobody decides to opt in, the system breaks. It becomes a one-sided messaging experience where nobody gets the real value of the feature. As the Intercom Messenger is all about being transparent and conversational, we approached read receipts so they had to be part of every conversation. Neither customer, nor business, has the option to turn it off. There’s no setting for this. When we initially designed the receipt, we displayed a “Not seen yet” label under the message. Once it was seen, we just removed the label. We never actually showed the words “Seen”. This was a deliberate decision we made; we were trying to lower user expectations of a response. But once we tested this pattern out in real conversations, we quickly realised it didn’t work. Instead of lowering expectations, it introduced more ambiguity. When no messages were marked as seen, how was anyone to know there was another human on the end of the line? We quickly realised we needed to communicate both ‘seen’ and ‘not seen’ states. 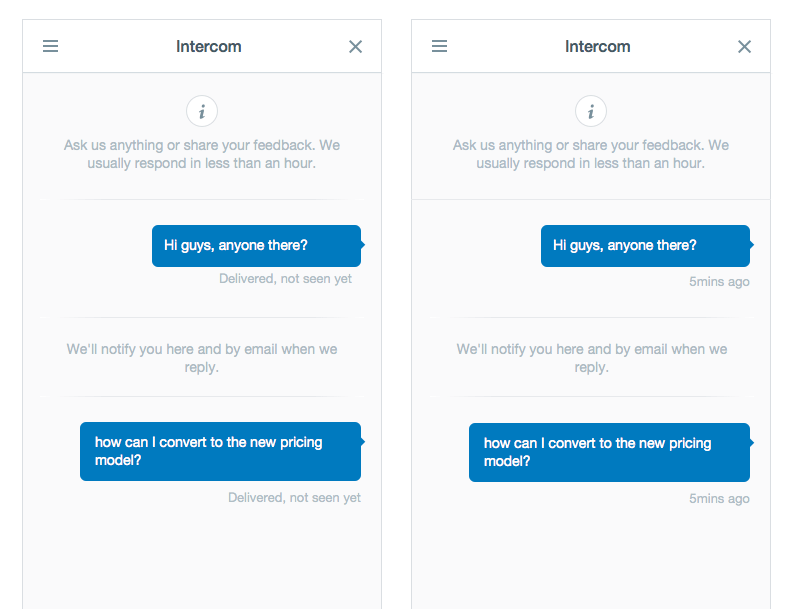 Consumer messaging apps serve as our product model, but there are some important ways Intercom is different. Intercom has a team inbox – any number of people might respond to a new conversation. And teams often triage conversations – they review new conversations and decide which to answer first. So we decided to design some breathing room for new conversations. We don’t mark messages from new conversations as ‘Seen’ until the first agent starts responding. This way, teams can safely triage new conversations, without unintentionally raising user expectations of a fast response. Read receipts are a great example of how a tiny, single phrase actually has big product implications. They’re an iceberg. They play only one small part in the orchestra of messaging, but they’re vital to our mission of making communications between customers and businesses more authentic and transparent. At Intercom we’re always grabbling with product issues like this. We’re growing like crazy now and hiring product managers. Why not come join us?